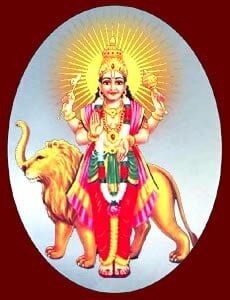 The eighth Nakshatra in Vedic astrology, Pushya is ruled by the chief advisor to the gods Brihaspati. The exalted nature of Pushya is conveyed by it’s symbol, the cow’s head. The deity ruling the Pushya Nakshatram is Brihaspati, chief priest and advisor of the gods. His essence is embodied in three faint stars in the constellation of Cancer. Difficult to see with the un-aided eye, the Jyotish clerics recognized the significance of this celestial trio long ago. 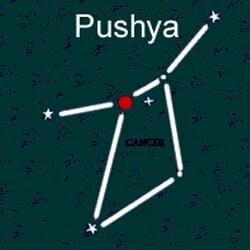 The Pushya birth star is symbolized by the cow in reference to the triad’s resemblance to a cow’s udder. The cow symbol is indicative of the native’s generous, nurturing and unselfish character. Connected to the concepts of growth and fertility, the cow symbol also draws our attention to its exalted spiritual position as the holiest of all animals. Known to be attractive people with engaging personalities, they are often endowed with good earning potential. Known for their easy-going nature, they are dignified and well-thought of in the community. However, they may be quick to anger and turn aggressive when their highly-held morals or religious beliefs are challenged. Unlike many other Nakshatram, there is no particular body type or appearance associated with the Pushya. Many will possess a distinctive mole, scar, limp or other visible identifying feature. Somewhat fragile and vulnerable, they are prone to heartbreak. Decision-making can be very challenging and the Pushya prefers to let others take the lead. They are known to fall victim to peer pressure as they have difficulty standing up for themselves in difficult situations. Their submissive tendencies may take them down paths they would never encounter otherwise. Strong boundaries are essential for the Pushya native to find success. Pushya people possess strong intellect regardless of their level of education and are very good conversationalists. Capable of achieving great professional successes, their success is often cyclic. They are prone to betrayal by business partners and/or make hasty decisions which result in great financial loss. These are adaptable creatures who will find success in professions related to media, communication, teaching and marketing. Cultivating personal and professional boundaries will help the Pushya maintain consistent professional success. Known to experience difficult childhoods, their loyalty to their parents is life-long. The birth star Pushya’s marital relationships may become strained as they have difficulty trusting others. With time and patience they are able to find compatible mates and have satisfying relationships. Plagued by health issues during their childhood, young natives of this Nakshatra may experience on-going issues such as liver problems, respiratory issues, stomach ulcers, gall stones, eczema, cancer and varied gastric disorders. These medical problems may account for the association with a difficult childhood.